According to the 2016 Census of Agriculture, total cropland area increased by 1% since the previous census, despite the amount of land included on census farms decreasing by 3%. In 2016 there were 2,022,199 acres of forage crops in Ontario. Since 2011, corn silage acres were up nearly 9% across the province. Acres for forage seed production fell by 29%. Alfalfa and alfalfa mixes dropped 17%, while all other hay and fodder crops fell 18% over those five years. Combined, Ontario has lost 14% of forage crop acres since 2011. Total pasture area in 2016 was 1,297,734 acres. Between 2011 and 2016, area of tame and seeded pasture decreased 21%, while natural pasture land decreased 20%. Dry conditions throughout the province in 2016 resulted in lower than average forage yields, although quality was very good. Many alfalfa fields were cut during the critical fall harvest period to increase the amount of stored forages going into the winter. These fields were at much higher risk for winterkill than those left unharvested or harvested after a killing frost. New seedings in many areas had poor vigour. During the 2017 growing season, alfalfa weevil damaged some fields in the southwest. Cool, wet conditions in the spring suppressed parasitoids, allowing the weevil population to get ahead of its predators. Wet weather delayed first cut, which enabled weevil populations to reach threshold in some areas. In general, growers may want to consider spraying if there is 40 percent tip feeding, two or three active weevils per stem, and more than seven days to preferred harvest date (J. Bagg, 2013). Potato leafhopper pressure was higher than average, and affected fields in central and eastern Ontario. Potato leafhopper caused severe damage on susceptible varieties – up to 50% yield loss in second and third cut – and affected resistant stands. Fields with serious hopper burn may have reduced survival over the winter of 2017-2018. Potato leafhoppers do not overwinter in Ontario. Rainfall grows grass, and 2017 was a good year for pasture growth. Overall, southern and northwestern Ontario received average amounts of rainfall, while the rest of the province experienced higher than average precipitation. In September, rust levels were above normal across the province. Rust is a fungus that infects grasses. It does not produce mycotoxins, but highly infected swards may have reduced palatability. Large amounts of rust spores may also cause respiratory irritation in livestock. If there is a concern with dusty hay, it can be soaked or diluted with other feedstuffs. In May and June, first cut was delayed by about two weeks in southwestern Ontario and up to three months in central and eastern Ontario due to higher than average rainfall. Wet field conditions made it challenging to harvest dairy hay and haylage at the optimal maturity, while short windows of dry weather limited opportunities to make quality horse hay. August and September brought average to dry conditions to most of the province, which enabled many farmers to catch up on harvest. In these cases, yields were good but quality was low to average. Many lots of forage were baled wet or rained on after they were cut, so farmers should test for moulds and mycotoxins. During usual haying times, eastern Ontario, Grey and Bruce counties received between 150 to 200% of average rainfall (Figure 1). Reports indicated that many farmers in these areas were harvesting first, second, and sometimes third cut simultaneously as weather permitted. Rain delays pushed harvest in some areas into the critical fall harvest period, which may reduce winter survival of alfalfa and lower yields in 2018. 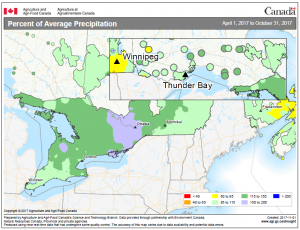 Planting dates were variable across the province as wet weather caused delays. An open fall added some of the heat units that were not received in June and July. Harvest began mid-September, and lasted longer than usual because of variable maturity. Some fields experienced frost damage prior to harvest. Overall, quality is variable. At press time, DON and vomitoxin levels in corn silage samples have been very low, but wet conditions increase incidence of ear moulds and sprouting, so farmers should still test for mycotoxins in this year`s corn silage. Quality of cereal silages (barley, oats, oat/pea, and rye) was consistently good. Ryegrass yields were very high and provided good quality forage. Cool conditions limited yield in warm-season grasses, like sorghum-sudangrass. Forage soybean acres were up from 2016, particularly in eastern Ontario.